The smoke was so dark they could barely see. KAMLOOPS, B.C. — At first, the drive didn't seem too bad. Sally Aitken and her husband decided to leave their cabin in British Columbia's West Chilcotin region due to wildfires on Sunday. They were not ordered to evacuate, but had been without power for days and the only highway out had recently reopened. As they drove along Highway 20, they saw nothing overly dramatic: light smoke, burned trees. Then they suddenly found themselves in the middle of an intense blaze, with flames leaping on either side of the road and smoke so dark they could barely see. "Your choice is, when it gets bad, do you turn around ... and then you have to go through what you've already been through, or do you just keep going? We just kept going," recalled Aitken in an interview. Smoke rises from trees burned by wildfire on a mountain near Ashcroft, B.C., on Monday. More than 200 wildfires are burning in the province and an estimated 14,000 people have been evacuated from their homes. "It was alarming but you can't panic because you've got to get out of the situation and you've got to think clearly." Aitken, a professor in forest and conservation sciences at the University of British Columbia, shot a video of the harrowing experience and posted it on social media. She hopes the video will be instructive to people who are fleeing the hundreds of blazes across B.C. "People really need to follow the advice of the professionals who are telling them when to evacuate," she said. "But we also need to keep in mind that fire behaviour is very unpredictable. As quickly as the weather shifts, the fire shifts." 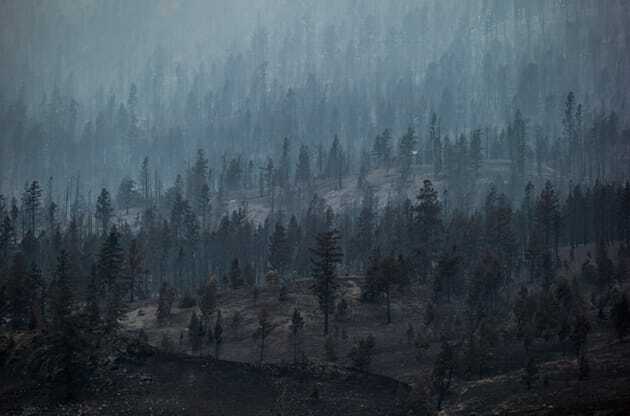 Provincial officials said Tuesday that 219 fires were burning and over 14,000 people have been forced from their homes. Thousands more are under evacuation alerts, meaning they must be prepared to leave at a moment's notice. The dynamic nature of the fires does pose challenges for officials handling highway closures, said Mike Lorimer, a regional director at the Transportation Ministry. When drivers come across heavy smoke, they should slow down, put their hazards on and keep driving, he said. An evacuation alert was issued for the more than 10,000 residents of Williams Lake Monday night. Municipal officials warned wind and lightning forecast for Wednesday could push fires towards the city at a "rapid pace." The Tsilhqot'in Nation said four of its six communities near Williams Lake are threatened and many members have already evacuated. Food, water, fuel and medicine are in short supply, it said in a statement. 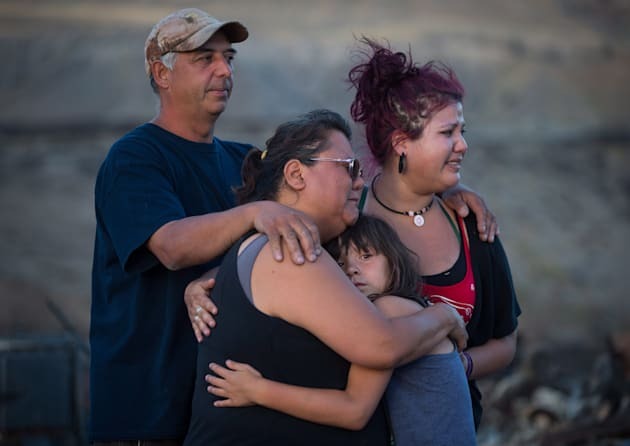 Randy Thorne, his wife Angie, their daughter Kelsey, and granddaughter Nevaeh, 8, comfort one another after being overcome with emotion as they view the remains of their home that was destroyed by wildfire on the Ashcroft First Nation, near Ashcroft, B.C., on Sunday. Joe Alphonse, chief of the Tl'etinqox community, said about 300 people stayed behind to fight the fires and save about 120 homes. They have some heavy equipment but the federal and provincial governments must bring in more resources, he said. "Tl'etinqox experienced evacuations twice before and leaving the community caused even more stress and grief. We have no choice but to stay and fight back," said Alphonse. Kevin Skrepnek, chief information officer for the B.C. Wildfire Service, said most people heed evacuation orders, but some do stay behind to fight the fires themselves. He said the province had provided the Tsilhqot'in with satellite phones. The toll from the fire near Cache Creek, west of Kamloops, was revised on Tuesday. Village Mayor John Ranta said in a conference call that more than 60 homes at a trailer park were destroyed. He had previously said 30 homes were lost. "Many of the people in the Boston Flats trailer park had only moments to leave and many were lucky to escape with their lives," Ranta said. 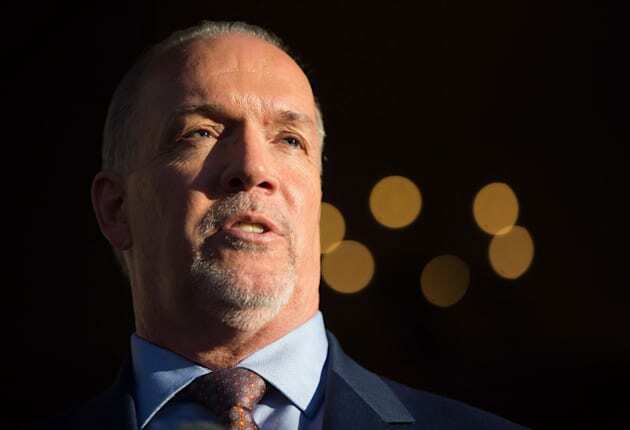 Premier-designate John Horgan said he had been in touch with First Nations and municipal leaders and planned to travel to affected communities later this week to view the damage. Hot and dry conditions are expected to continue across B.C. 's fire-stricken regions, primarily the central and southern Interior. British Columbia premier-designate John Horgan speaks in Victoria on June 29, 2017. "I think people have to realize this is not going away on the weekend," said Horgan. "This is going to be the next couple of weeks, perhaps the rest of the summer. And we have to stand together." Bob Turner of Emergency Management BC said officials were planning ahead for the possibility of mass evacuations, including from Williams Lake. Four emergency experts are arriving from Alberta to help with planning, while Canadian Armed Forces aircraft helicopters were on standby if airlifts are needed, he said. Wildfires have scorched about 430 square kilometres of land so far this year in B.C. The blazes are being fought by some 1,000 B.C. firefighters, with about 300 colleagues and support staff arriving from Alberta, Saskatchewan, Ontario, New Brunswick and Manitoba. 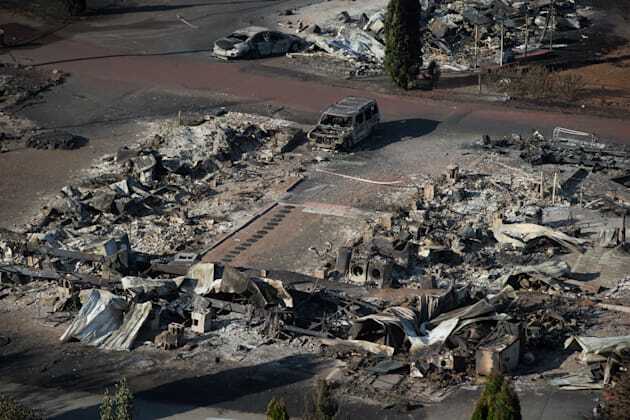 The remains of mobile homes destroyed by wildfire are seen at a trailer park in Boston Flats, B.C., on Sunday. Three hundred additional RCMP members from outside the fire areas have been re-deployed to help and another 40 members are being brought in from Alberta, said Deputy Commissioner Brenda Butterworth-Carr at a news conference. Officers are patrolling evacuated areas around the clock and about 10 people have been arrested for break and enters in 100 Mile House and Williams Lake, she said. "This is an unprecedented situation and one that continues to rapidly change. We appreciate the public's patience."